Yesterday was bracketed by two Mauds, both of whom had links to literary poetesses. I started my day with BBC Radio Four’s Women’s Hour, listening to an audio version of A. S. Byatt’s Possession, in which fictional English professor Maud Bailey was researching the work of nineteenth-century English poetess Cristabel LaMotte, her great-great-great aunt. 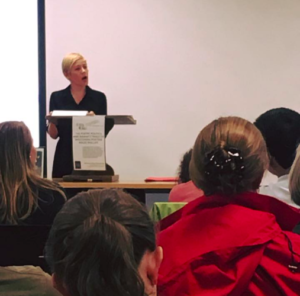 I ended my day with Maud Phillips, a very real early twentieth-century American poetess, whom English professor Stephanie Farrar introduced to the audience of the CHPDC‘s first talk of the academic year 2016–2017. Maud’s biographical details lay the foundations for a riveting story. She married a man named Wilbur Phillips, whom Farrar portrayed as an unreliable husband. Wilbur had spent time in jail for wanting to keep his children out of public school. He also exercised his power to commit Maud to the insane asylum on more than one occasion, as well as release her from it. 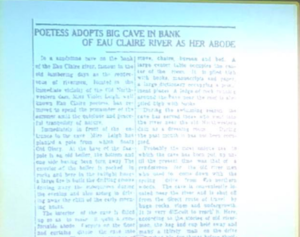 While Maud’s trips in and out of the asylum sometimes condemed her for failing to conform to social expectations, they sometimes garnered public adoration from those who attributed her allegedly unstable mental state to her artistic sensibilities – to note, an article from the local newspaper The Eau Claire Leader entitled “Poetess Adopts Big Cave in Bank of Eau Claire River as Her Abode.” Documented affairs with married men, including a clergyman whom Maud threatened to expose by sending a poem to his parishioners, seem to have fueled her writing rather than hinder it. It was Maud’s everyday life and activities of artist, citizen, mother, wife and lover that provided the inspiration for her poetry. Although she published under the pseudonym of Violet Leigh, the readers of The Eau Claire Leader knew Maud well and applauded her poems. Farrar argues that this type of poetry, reminiscent of nineteenth century traditions but written in the first two decades of the early twentieth century, suggests a more gradual transition towards “modernism” than traditionally thought. The subject of Maud’s poems range from the private – seasonal transitions and the loss of a child, to the political – “What is Best for Eau Claire?” Through her poetry Phillips appears to reconcile her experiences of life’s hardships with its pleasures, sharing her talent and intellect with her audience. Yet Phillips had her critics. In 1911 Miss Mary Grant O’Sheridan, herself a poetess from Madison, Wisconsin, publically accused Phillips of plagiarism, citing Maud for having stolen lines from such popular poets of the time as Robert Browning, Henry Wadsworth Longfellow and Robert Louis Stevenson. In her defense, Maud responded in The Eau Claire Leader that she saw herself more as a paraphrast, borrowing from these wellknown poets, not plagiarizing them. Perhaps as a twist of fate, O’Sheridan herself was committed to the Elgin, Illinois insane asylum in her later years and eventually died there. Maud’s poems survive in three collections: 1) a manuscript copy of private poems held in the University’s Special Collections and Archives Library at Eau Claire; 2) a copy of a printed book that contains her poetry held in the William B. Cairns Collection of American Women Writers at the University of Wisconsin’s Memorial Library Special Collections in Madison; and 3) in “The Eau Claire Leader,” among others, accessible through online databases for historical newspapers. According to Farrar, it is wrong to think that women had difficulties getting published in the early twentieth century. 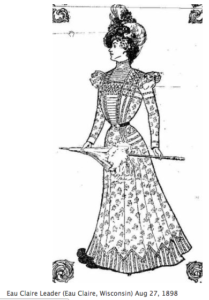 Women like Maud Phillips were frequently published, and with public approval. Despite Phillip’s many protestations that she had no time to write in her busy life, it was that very busyness of being human that provided the content for her poems and the recognition that Farrar argues as well-deserved.